Every pirate needs a treasure map. I started with a piece of painter’s canvas (the kind you cover your floor with when you paint your walls). I stained it with coffee grounds, burned one of the edges, and splotched red food coloring on it (for blood – it really needs to be darker though). I then used a fine tip Sharpie to draw on the map. 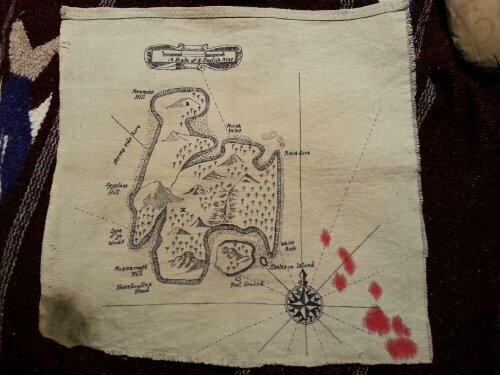 I just free handed it, looking at the map from the book Treasure Island.